David Lowell is a private detective with the Starlight Detective Agency. His daughter, Melinda, is a defense attorney with a new client who is accused of murdering a judge. Her client, Johnny, had the motive and the means to kill the judge, but did she really do it? Melinda enlists the help of her father and his eccentric staff ~ Mort, the computer hacker; Sarah, the assistant; and Andy, the driver/security guard ~ to find out. In Murder in the 11th House, Mitchell Scott Lewis develops a unique detective story. Lowell doesn't just rely on his instincts and smarts to determine what really happened to the judge. He also relies on astrology to get to the truth. He looks at the birth charts of the various players, and composite charts that show the relationships between the victim and all the potential suspects. He uses astrology to better understand people's motivations and their true feelings ~ and to eventually solve the crime. The characters are all quite interesting. Each has his or her own quirkiness that makes the story fun and lighthearted. I enjoyed the interactions between the characters as well. The mystery itself is one that kept me guessing through to the end. There was always a question as to whether Johnny really did kill the judge or not. Some of the actions and events were a bit unrealistic to a point, but overall it was a fun detective story with interesting characters and a plot that holds together well. I think you do need to have some level of interest in astrology to enjoy the book completely ~ not necessary knowledge about it, but interest in it. I expect someone who is opposed to the idea of astrology would be frustrated with the book. I happen to have a decent level of knowledge about astrology since I have a friend who is an astrologer. But I think as long as you have an open mind and believe that astrological charts can really tell us something about people and their motivations, you will enjoy this unique story. 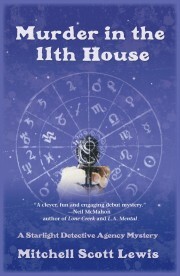 Murder in the 11th House is scheduled to be published on September 6, 2011. This review was written based on a copy of Murder in the 11th House that I received from Poisoned Pen Press through NetGalley in exchange for an honest review.